Hermannator Ice Bock is a dark chestnut colour that appears almost opaque. Its full-bodied, rich malt palate blends well with mild bitterness. A smooth, but assertive mouthfeel contains hints of plum spiciness. A warming brandy like finish rounds out this outstanding winter ice bock. 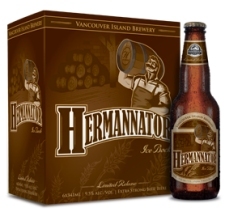 Hermannator has been in select Victoria-area liquor stores since late October, and will remain available while supplies last.